In the history of Japanes painting, it was around the time of the Heian period when its own features came out. Until then, most of the paintings showed the people at the time or the dogma of Buddhism. 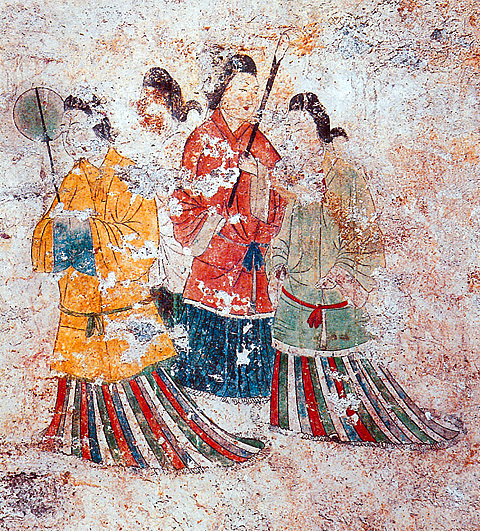 The colored wall paintings of Takamatudzuka Kofun tell us the figure of the noble women in Asuka Period. And “Kako Genzai Einga-kyo” painted in Nara Period cut the history of the scroll paintings and dipcted the ancient Buddhism. After that the paintings in Japan started on a a full scale, the birth of “Yamato-e（大和絵）”. Yamato means Japan in ancient time. One of the technique of “Yamato-e” is drawn by stacking to top up distant things in the same size. So it has been said that the Japanese hanging scrolls are vertical. But in late 10th century, a horizontal world also appeared in Japanese painting. “picture scroll/Emaki-mono（絵巻物）”, which composes Yamato-e and document, unfolds from the right to the left on a long screen. Due to the rise of Zen, introduced from China,” ink painting/suiboku-ga（水墨画）” became popular in Muromachi Period. Ink painting often has been thought of as painters depicted a scene actually they seen. But Japanese artist hadn’t practiced sketching as basic of painting until modern time. Sesshu(雪舟） is the most famous artist who painted ink painting. Sesshu, a monk of Zen sect, belonged to the orthodox school of suiboku-ga.
His work is realistic, but it is not a reproduction of a real, but his insight into the depths of nature. In Azuchi-Momoyama period, popular painters, including Kano Eitoku（狩野永徳） and Hasegawa Tohaku（長谷川等伯）, drew “sliding door paintings/Husuma-e（襖絵）” and “folding screen picture/Byoubu-e（屏風絵）” for daimyos. The castle tower is a symbol of the castle, representing the character of the owner. Kano Eitoku was entrusted with paintings to use for the castle tower by Nobunaga Oda and Toyotomi Hideyoshi. They were the most powerful in Japan at that time. Kano school also had succeeded in early Edo-Perido. And Rinpa school had showed up as their rivals. Tawaraya Soutatsu was founder of Rimpa school. After his death, Ogata Korin widen his apeal from paintings to art crafts. And people could became enjoy paintings for the first time in Edo-Period. Paintings had been always intended for those in power. But the marchants introduced a woodprint and started a publishing business. “Woodblock print/ukiyo-e（浮世絵）” was widely familiar to people and had an impact on Western art. Katsushika Hokusai, Utagawa Hiroshige and Kitagawa Utawamaro are very famous around the world. This entry was posted in paintings and tagged japanese paintings, ukiyo-e. Bookmark the permalink.